Dramatic landscapes. Enchanting ghost towns. Highbrow art. Big Bend is home to a wild mix of culture, adventure and quirky vibes. In each major town, artistic endeavors play a starring role in local entertainment. Head to El Paso to take in opera under the stars at McKelligon Canyon Amphitheatre and classical concerts by the local symphony at the Plaza Theatre. Their museum of art is a must-see as well, with a mix of American, contemporary European and Mexican art collections. 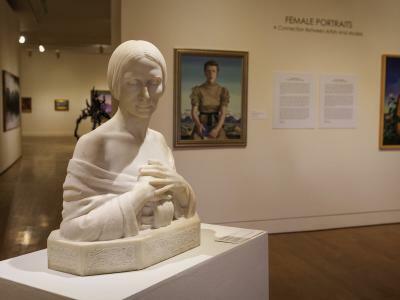 For some art and culture in Midland, you can check out the Museum of the Southwest, which is dedicated to art, science and history, with a multitude of collections and exhibitions. If you find yourself in Marfa with time to kill, you’ll want to take in the contemporary art collection of large-scale installations hosted by the Chinati Foundation. Their resplendent pieces incorporate the surrounding landscape and occupy a 340-acre former Army fort. While the most intrepid adventures happen inside Big Bend National Park, it’s highly recommended to do some exploring in the neighboring towns. About 20 miles west of the park’s entrance, you’ll find the Lajitas Golf Resort. It’s not exactly rugged, as the unexpectedly verdant fairways are framed by a mountainous horizon and gorgeous blue sky. On your way from Lajitas to the park, you’ll pass through a legendary ghost town known as Terlingua. In this former quicksilver mining town, you can explore abandoned rock cabins, check out views that stretch all the way to Mexico and see live music at the famed Starlight Theatre almost every night. For guided adventures within the national park, Terlingua-based outfitters serve up rafting and canoe trips that course through magical canyons, Jeep and ATV tours of prehistoric cave art and trips to refreshing waterfalls and spring-fed swimming holes, as well as mountain biking tours along the Rio Grande and in remote stretches of backcountry. 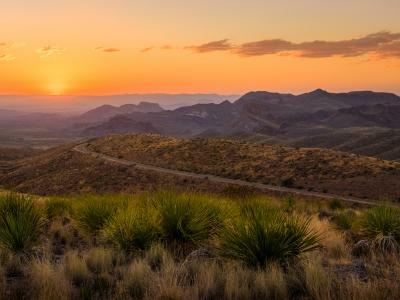 To hit the highlights of a perfect trip to Big Bend National Park, your exploration should include a picnic in the serene Cottonwood Campground, a magnificent hike along the Santa Elena Canyon Trail, a soak in the hot springs near Rio Grande Village and an afternoon hike in the Chisos Basin, punctuated by some of the most gorgeous sunset photos you’ll ever take at the beloved Window. And for a truly authentic Rio Grande experience, take a rowboat from Boquillas Canyon to the Mexican village of Boquillas. You can hop aboard a horse or burro for a ride up to the colorful village, where you can fill your afternoon with handmade tortillas, cold beer and tequila while getting to know the locals. 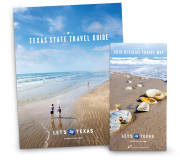 As remote of a region as Big Bend may be, you’re never too far from music, art, culture or adventure. This sprawling desert is an oasis for the soul, full of unexpected discoveries and quietly majestic beauty.